Just a musical? Or a dangerous revision of history? As if all “Allegiance” needed were a few rap lyrics? I’m sure the creators hoped for something along the lines of a “South Pacific” meets the internment. Our darkest Asian American story given the big musical treatment. One that might make you laugh, cry, sing, and think. You leave the theater humming to the memory of a freshly-told love story amid a tragic history too often forgotten. 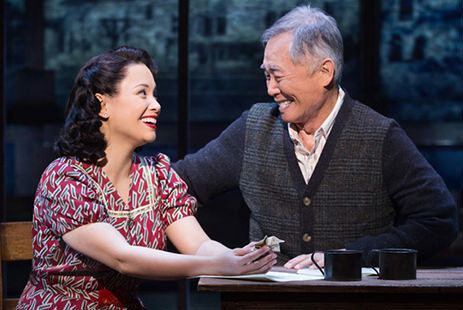 Instead, “Allegiance,” the Broadway musical based on George Takei’s story of the incarceration of Japanese Americans during World War II, received lukewarm reviews and was spurned at the box office. If only it had attracted more people, it might still be running in New York, with plans of a nationwide touring company. That was not to be, as the show closed unceremoniously in mid-February. If you missed it, don’t despair. You get an early Christmas gift, the chance to experience “Allegiance” at movie theaters all across the country, but for one night only, Dec. 13. Takei filmed the show and packaged it with interviews and behind-the-scenes clips so you can see for yourself what all the fuss was about, critics be damned. Though iterations of the musical ran in San Diego as early as 2012, I’ve never seen the show and didn’t make it to New York. I’m actually looking forward to the filmed version at my local movie house in California, not far from a strip of state Highway 99 that commemorates the 442nd. I want to see if the show has the power to make me care if they play it a bit loose with the facts. That’s been the biggest non-theatrical criticism of the project. Does it fudge too much? In telling the fictional tale of the Kimura family, “Allegiance” would appear on steady ground, story-wise. Takei plays “Grandpa” and sings better than Captain Sulu. The big voice is Lea Salonga, who plays Kei, his granddaughter. Filipina actor Salonga, who won a Tony in 1991 for the role of Kim in “Miss Saigon,” is used to playing multi-ethnic, pan-Asian roles. And then there’s Telly Leung, from “Rent” and “Glee,” who plays Kei’s brother, Sammy. The show portrays the conflict within the Japanese American community, especially among the younger generation. Do the young men join the military and show loyalty to the U.S? Or do they resist? And what of the young women? The problem is in the portrayal of the civilian-based concentration camps. Too banal for Broadway, so of course things get juiced up. Producers conflate two camps, Heart Mountain with the worst segregation center at Tule Lake, near the CalIfornia-Oregon border, and made them look worse than they were, according to Frank Abe on his blog. Abe produced and directed the PBS documentary, “Conscience and the Constitution,” and was a former national officer of the Asian American Journalists Association. During “Allegiance” previews, he was the musical’s most vocal critic. Abe was concerned about how life was depicted in the camps, as if it were a Nazi POW camp, which it was not. There were no guns and no violence in the camps, he said. “Camp was degrading. It was dehumanizing. But this heavy-handed treatment inflames emotion at the expense of fact,” Abe wrote. And then there’s the case of the JACL’s Mike Masaoka, whose real name was used in the production, unlike other fictitious characters. Masaoka never spent time in camp, but was the first to enlist in the much vaunted 442nd. He encouraged the incarcerated to join the military to prove their loyalty. Of course, others resisted. So who were the real patriots of the Constitution? For example, no one burned draft cards, nor did anyone riot over the war/loyalty issue, said Abe. Resisters were principled in their stance, knew they would face prison time and a major fine, and didn’t whine. He also noted that they never faced charges of treason nor a capital crime, as implied in the musical. And none of what was going on was secret. Maybe the producers put a bit more wasabi on the history to heighten dramatic effect. It’s not history. It’s show business, based on a true story. I regard the mass incarceration of Japanese Americans, along with the Filipino Veterans of World War II, as the two stories that give Asian America its moral standing. They should be seen as our sacred stories. And the truth needs no embellishment. Nevertheless, I’m still looking forward to the showing on Dec. 13th. I’m not expecting a history lesson. I just want to see how the musical ensemble makes me feel about the U.S. rounding up 120,000 innocent Americans of Japanese descent. If the film experience of “Allegiance” hits on some part of that emotional truth, that would be enough to make “Allegiance” worth seeing. You can purchase tickets to the Dec. 13 screening of “Allegiance” here.